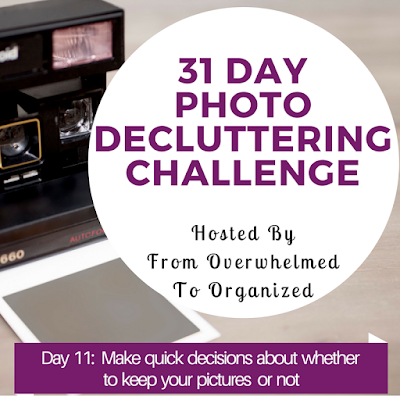 Today I'm talking about how making quick decisions will help you declutter your photos. Photos are filled with memories. That's why we take them. It's why we keep them. They remind us of people, places, and events in our lives. So when we're decluttering photos, it's easy to get bogged down in all the memories. Doing that will make the task a lot more overwhelming. It will take a lot longer and we will feel discouraged when we don't see as much progress as we'd like. 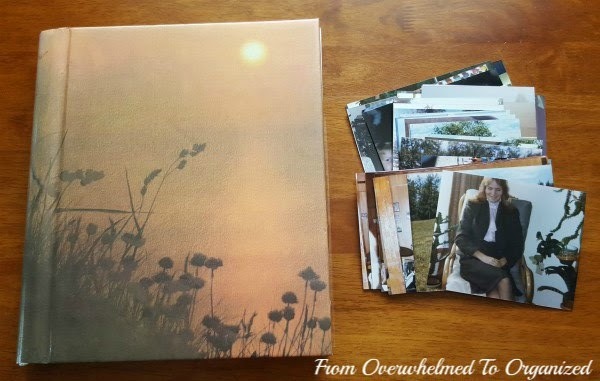 Try to make quick decisions about whether to keep or let go of each photo. If you have multiple pictures that are very similar, take a few seconds to choose the best one or two of the bunch and then all the rest can go. If you only have one photo of a particular event then decide quickly if you want to keep it to remember that event or not. This is especially important for your digital photos. If you have thousands of photos in your collection, you simply can't take very long to decide or you'll be decluttering photos forever. Here's some basic math... for every 1000 photos, if you take 1 minute per photo to decide, that's 16 hours and 40 minutes. Multiply that by 10 if you have 10,000 photos and that's 1 week of decluttering photos 24 hours a day! I'm not trying to scare you or overwhelm you. I just want to put it in perspective for you. 1 minute per photo will take you a long time to declutter your collection. A few seconds per photo is much more realistic. Back to math... for 1000 photos, if you take 5 seconds per photo to decide what you want to do with it, you'll take 1 hour and 23 minutes to finish. That's more reasonable, especially if you multiply that by 10 or more, depending how many photos you need to go through. I'm sure there will be some photos that are easy and will only take a second or 2. And other photos will take longer than 5 seconds. But keep reminding yourself to not take too long. You can set a timer for 10 minutes and see if you can go through 120 photos (that's 5 seconds per photo). Based on how many you get through, you can adjust your goals and your speed. If you find you're really taking a long time, try to go through photos that are easier first and set aside the ones you need to think about more for later. You'll be able to get through more of your collection that way and then you can take your time on the harder ones at the end. Or, keep all the photos you're not sure about. You can always go back through your collection in the future and you may find it easier to let go then. So your decisions now are simply keep or toss and you're deciding within a few seconds. I decluttered another one of my older photo albums and let go of 60 more pictures, which represents about 60% of that album. Most of this album contained photos from various camps I attended as a teenager and I kept group photos and pictures with people I still remember. I let go of pictures of people I don't remember. I also chose the best photo out of groups that I had multiple shots of. Today your task is to time yourself to see how quickly you're making decisions about your photos. Assess whether this is a reasonable pace or whether you need to make adjustments. I'm really curious to hear what your pace is! How are you doing in the 31 Day Photo Decluttering Challenge so far? How do you think today's tip will help you? How long are you taking on average per photo? What photos are you decluttering today?